Today is my birthday. Today I turn 32, the same age my mother was when she died, twenty-five years ago. Today we read of an orphan pleading with her God for mercy and peace, and I think how very providential it is that I was tasked with writing today. Ever since my mother’s death, the day of my birth has been met with ambivalence. A desire to draw it close around me, this day each year that commemorates the fact that I was once alive inside her—yet at the same time a burning need to push away this day that reminds me, yet again, of all I have had to live without. It is this day, more than any other, that bubbles the wellspring of grief inside of me. Queen Esther would sympathize, well-acquainted with loss. She too was an orphan, queen of a people bereft of identity under Persian rule. She cries out to God, “And now, come to help me, an orphan . . . turn our mourning into gladness and our sorrows into wholeness.” This, then, is the cry of all those who mourn. It is not an accusation hurtled heavenward, though at times it may feel so. Embracing our grief, not kicking it away, is the price we pay for God’s transformation to joy. What I’ve learned is that when we ask God for transformation, He rarely fails to deliver tremendous opportunities for us to transform. It’s brutal and beautiful soul work that requires being willing to allow God into the depths of our pain, where He baptizes it in His ocean of mercy and love. As Jesus reminds us in today’s Gospel, “Ask and it will be given to you; seek and you will find; knock and the door will be opened to you.” We have also been taught that we are blessed when we mourn, for it is then that we will be comforted. God asks us to invite Him into our grief, and it is that invitation that carries with it the seeds of transformation, and ultimately, joy. In the depths of our pain He baptizes us in His ocean of mercy and love. 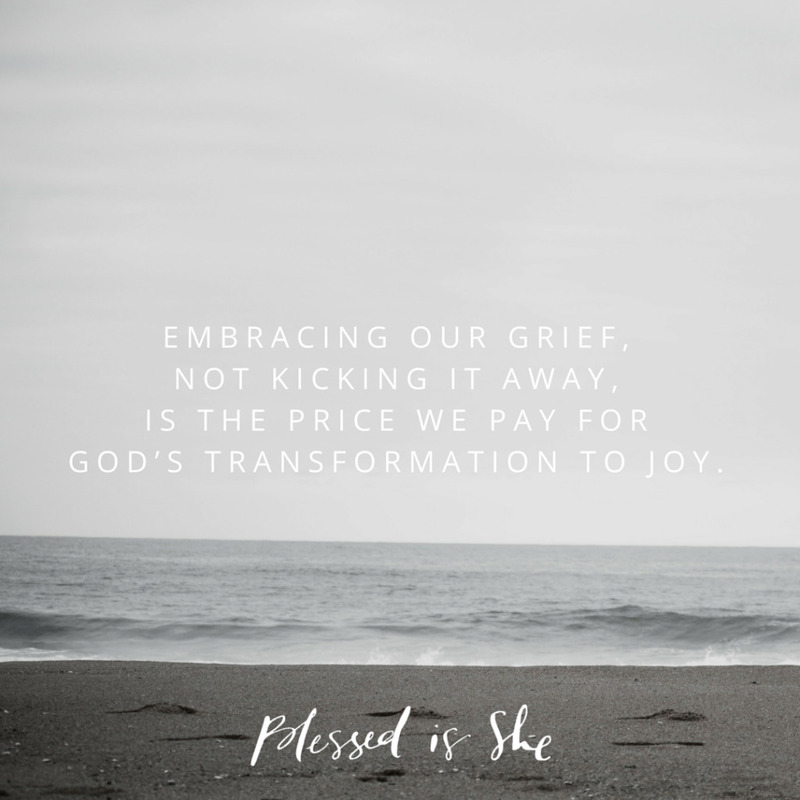 What long buried grief can you invite God’s mercy and transformation into today? How can you comfort those around you who mourn?